What was your first leopard sighting in the wild? Rodney: My first sighting was around twenty years ago in the Sabi Sands game reserve where I was doing my field guide training. I had grown up in the Eastern Cape and the village elders would always tell us stories and fables about the leopard but I had never seen one! When I finally did, it was a big male leopard and the experience was completely mind-blowing! Where and how did you learn to track leopard? Rodney: To be honest, I learnt to track leopard through pure love. I have this fascination, actually more like an obsession, with leopard. Most of what I know is self-taught, every time I have gone out into the bush since I started as a field guide I made it a point to find them. What are some clues and signs for finding leopard? 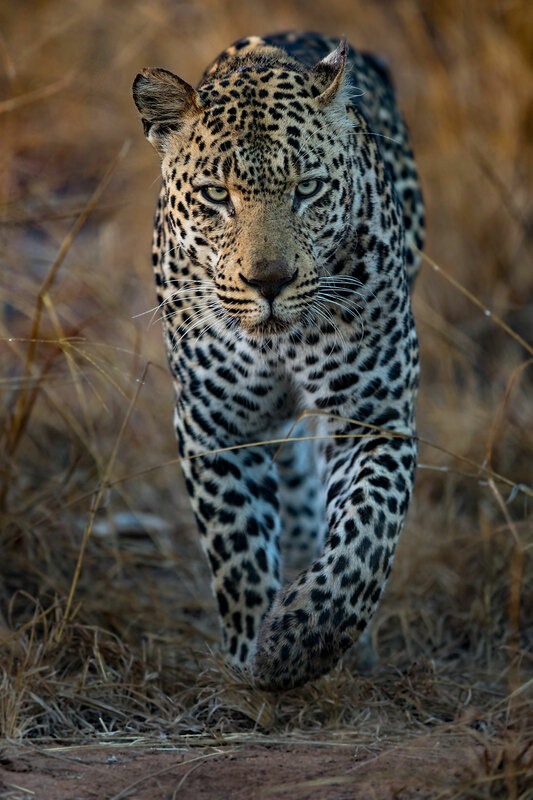 Rodney: Firstly, the most important thing to recognise is that when tracking any animal, and a leopard is no different, ( is that ) you need to form an understanding of the animal’s behaviour as well as their habitat. One must understand hunting patterns and what terrain and landscape they prefer. With a leopard’s behaviour we know this cat is solitary, elusive and shy. Known as the “silent killer”, leopards are the masters of camouflage, so you will have to take note of a lot more than just scanning the landscape. Leopard don’t like to be seen and perhaps that is part of what I find captivating about them. Whist other wildlife like elephants or lions may storm across your path or pass out on the side of the road in a game reserve, leopard will stealthily avoid you, so in some ways you need to mirror their behaviour to be able to enter the intimate space of sitting with a good leopard sighting – to think and be like a leopard is a good mindset to have. If I see spoor (animal faeces) on the side of the road and it is relatively fresh I will switch off my engine and wait, and wait, and wait. If a leopard has disappeared off a road people usually think “Ah, this leopard has gone”, but 8 out of 10 times if you can sit quietly and wait, the leopard will come back onto the road and continue its journey. This is where patience is key. Other signs to look for (besides spoor) are paw prints and dredge from a kill. Watching the soft sandy areas on the side of the road is a good place for these clues. When I find such clues, I will spend a long time in that area trying to come up with possible answers as to where this leopard is. Again, I switch off my engine and scan the area. I really don’t mind spending an hour or more in one place to try and find a leopard. I am also a master of “relocation” so when I hear a leopard is in an area, I will go back to that area after everyone has moved on and try to relocate it. Patience is my ally in this game and 8 out of 10 times when people think a leopard has moved on, I will wait it out and find it. Obvious habitat clues are looking for habitat that is in close proximity to trees. Leopard also love riverine habitat so I always look along rivers for places of crossing. Suitable prey animals are also a clue, such as impala which are sought out by leopard, as well as other) mid-size game. Always keep in mind as well that wildlife doesn’t lie! The sounds of the bush hold vast clues to what is happening. Vervet monkeys are good sirens indicating the presence of a predator, as are some birds and squirrels that serve as good indicators. Look for behavioural signs from impala and giraffe. If I pick up any odd behaviour, then I usually investigate. For example, if impalas are grouped together with their backs against each other looking out nervously, something may have alerted them. 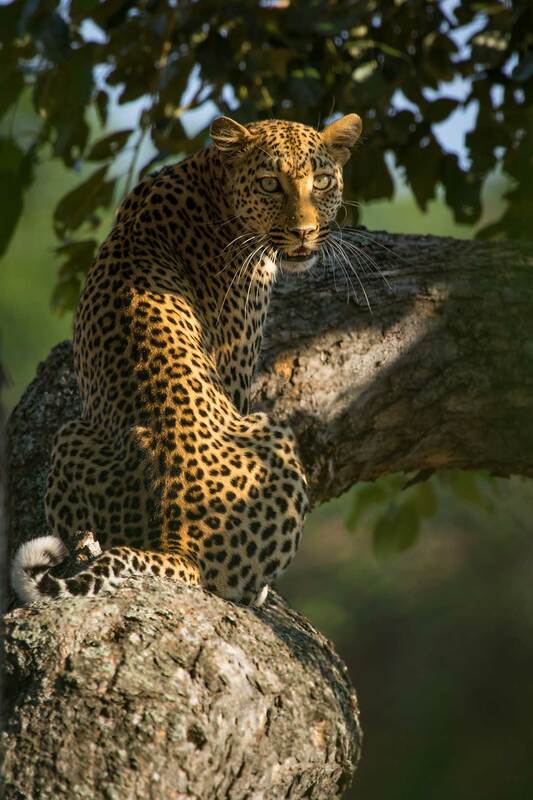 They may not be alarm-calling which means they may not have actually seen a leopard, but they may suspect the presence of one or have seen one and then lost sight of it. My last advice would be to remember that as the masters of concealment, leopard work on their own clock and have their own rules. When I was a young guide I would see the game looking relaxed and think “There are no predators here.” Now I know that being animals that don’t announce themselves, you can never take anything for granted when it comes to leopard. From my experience, leopards are active all throughout the day. They move a lot regardless of where the sun is. Whilst lions hunt in the early morning and by midday are taking a snooze in the shade, leopard will be active mid-morning and I have seen them make kills during the absolute hottest times of the day! Around 2 or 3 in the afternoon when the shadows start getting longer and the light softer, I will concentrate around the shadows under trees and often see their familiar shape sitting there. 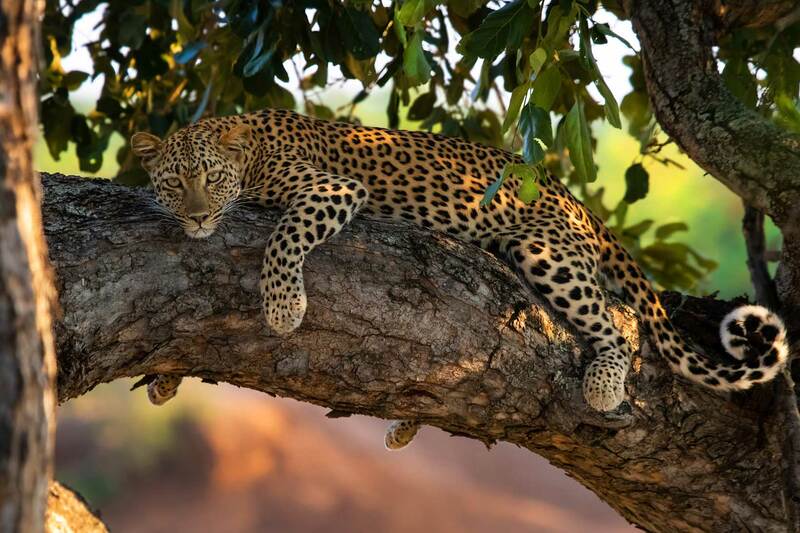 I find that leopard like the ground, and although they are excellent climbers and will use trees to guard a kill, I find them most often on the ground. 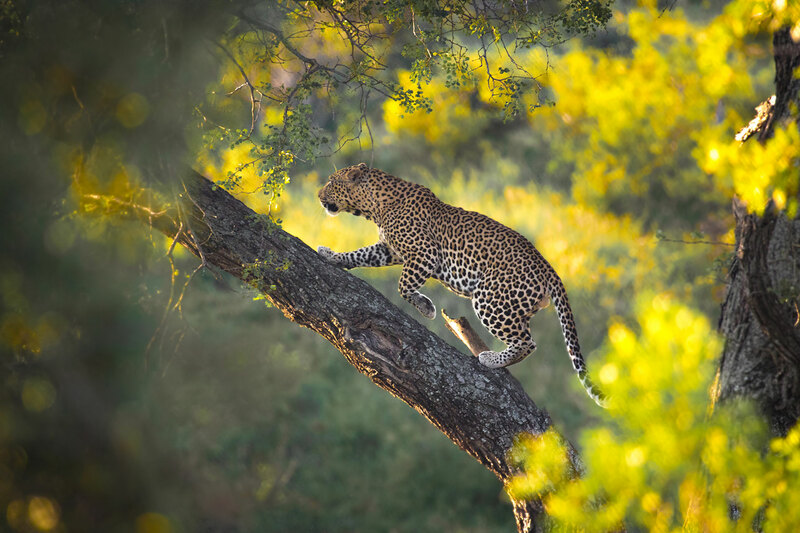 What is the most memorable leopard sighting you have ever had and do you have a photo of it? Rodney: It is difficult to pinpoint one as I have had so many spectacular sightings, but if I had to select one it would probably be in the Shingwedzi area of northern Kruger National Park. I tracked a female leopard that had just made a kill and basically spent two days with her. The first day I sat in my vehicle for 10 hours, barely moving, waiting for her to come back to her kill. When she eventually did it was just me and her and I got my photo. The next day she would leave again for the day and come back and sneak into her tree to continue eating her kill. This was such a special, intimate experience and probably my most memorable of not just leopard, but any animal in the wild. Some people battle to identify a leopard, help us clear this up by pointing out a leopard’s most distinguishing characteristics. Rodney: The leopard stands out from most African cats as, in my opinion, being the most beautiful cat in the world! The one cat people may confuse it with is the cheetah, however the spots on the body are not the same; the leopard has more distinctive rosettes. Cheetah have recognisable black tear marks on their faces which leopard do not. Leopard, being tree climbers, have very long rounded tails whereas cheetah’s tails are more flattish. And lastly, if you see a kill in a tree, 99,9% of the time, it’s because it was killed and put there by a leopard. Thanks so much Rodney for sharing your passion and wonderful knowledge of leopard with us!